Deciding what bicycle to get can be a little bit overwhelming. This some of the inspiration I used to configure my bicycle. This is the original Genesis Fortitude Adventure. It's not exactly your everyday mountain bike. It has a steel frame without any suspension and only comes in the color green. It also lacks the derailleurs and gears that practically all mountain bikes have. Instead it has the Shimano Alfine Inter 11 hub which makes it look very clean. The frame has lots of braze ons for racks, mudguards and bottles. It has 29" wheels. Which means that it has 622 mm rims with some wide tires on it. You can see that the seat tube is somewhat thinner on the bottom to provide enough clearance for the big wheels. I like the big wheels, but don't care much for the knobby tires since I do most my riding on pavement. The bicycle also comes with disc brakes, which requires special braze ons on the frame. The brakes used are Avid BB7. Unlike most disc brakes these are mechanical instead of hydraulic. This means that they work with a regular brake cable. The BB7 is widely regarded as one of the few mechanical disc brakes that works just as well as some hydraulic ones. The handlebar is very low, flat, wide (680 mm) and almost straight with round grips that are only comfortable when wearing cycling gloves. The seat is thin and small, meant for a forward leaning position where some of the weight is on the arms. The pedals are meant for cycling shoes with the SPD-system. To sum it up I like the frame, drive train, wheels and brakes. I don't care much for the tires, handlebar, seat or pedals. After the bicycle was seriously discounted I decided to buy it instead of a frameset and convert it into a touring bicycle since the things that I didn't like about it were relatively easy to replace. 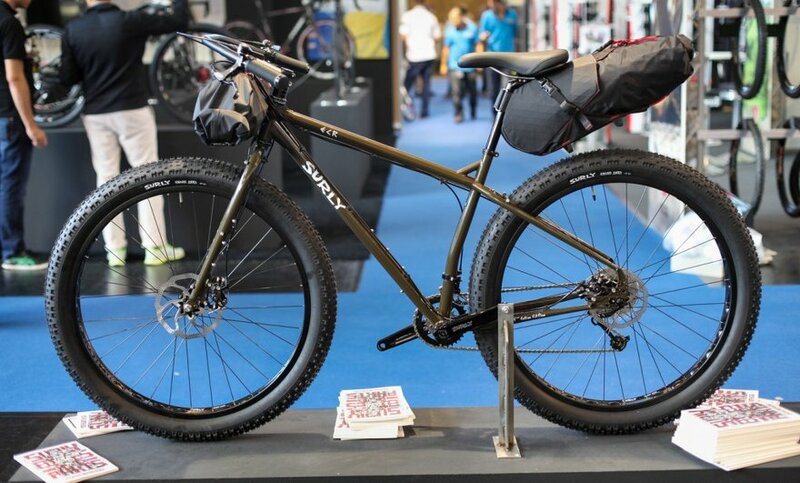 Genesis Fortitude Adventure with Big Apple tires and a raised handlebar. This bicycle has been converted for road/city use. It uses a longer front fork and some raiser bars for a more upright riding position. It has some Schwalbe Big Apple tires that don't have any knobs. 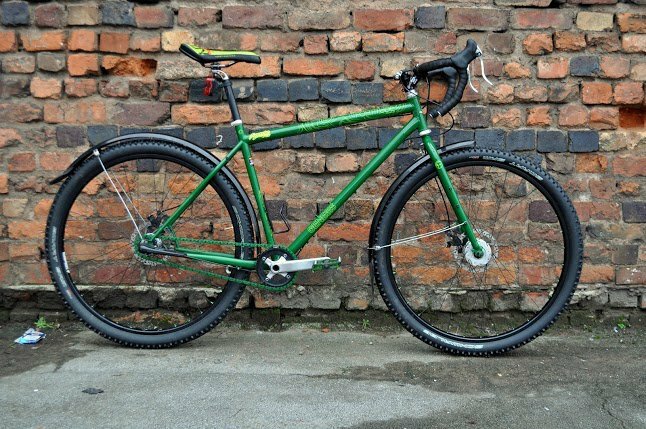 Single speed Genesis Fortitude Adventure with drop bars. Not exactly my cup of tea, but it shows that you can make an completely different bicycle with the same frame. It has single speed hub without any gears. The stays of mudguards in the front have been attached to a higher eyelet to get clearance around the disc brakes. I like the green chain and pedals. 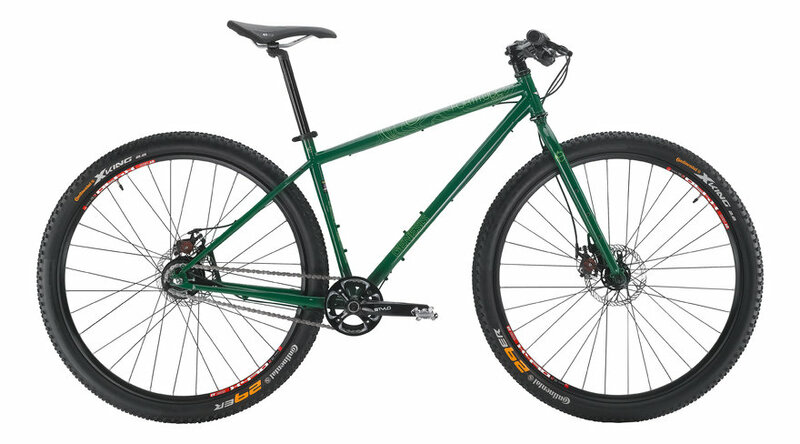 The Surly ECR was announced during Interbike 2013 after I had already decided on the Genesis Fortitude Adventure. Surly ECR with Jones H bars and seat bags at Interbike 2013. 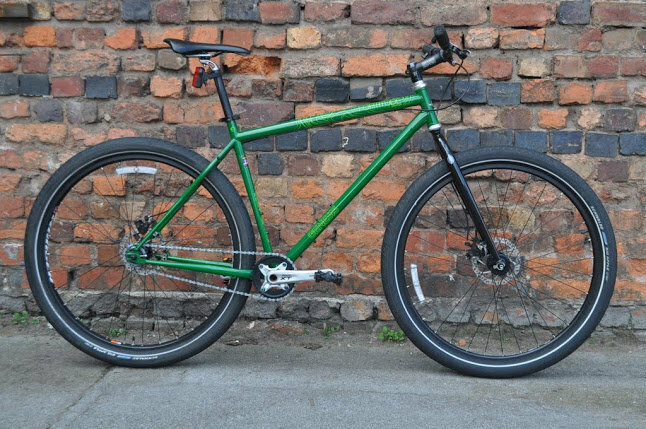 Although the Surly ECR is fat bike which is a slightly different kind of beast it has lots of braze ons for mounting stuff all over it. However what I really liked are the handlebar. These are the Jones H-bars, they provide many different hand positions, or even attaching luggage to it! The problem with the Jones H-bars is that they are a little bit expensive and I wouldn't know where to get them in Europe. Inspired by this I found the Ergotec Boomerang and Ergotec Space handlebars that are not quite the same but do allow for some extra hand positions.